Pioneers in the industry, we offer flexible manufacturing system set up from India. 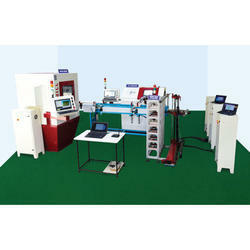 Flexible Manufacturing System Set Up is an evolutionary process from numerical control ( NC ), then computer numerical control ( CNC ), to manufacturing system. Numerical control provides the ability for a machine to use a program to process a part. Computer numerical control provides the ability to store multiple programs and interchange these programs for a machine. CNC Controlled machines combined with a pallet changing device provides the ability to process a mixture of parts without setup. FMS combine multiple CNC controlled machines with pallet handling systems, pallet load unload stations and a supervisory computer control. · To reduce set up and queue times. · Reduce time for product completion. · Utilize human workers better. · Produce a variety of items under one setup. Looking for Flexible Manufacturing System Setup ?